Published on 6 February 2007. Guido and Iain Dale tell us that, later today, the Conservatives will launch a big public campaign against the government’s ID Cards scheme. This is excellent news (see my rationale from almost three years ago – it’s still scarily relevant), and it actually seems that they’re serious. For a politician that has urged politicians to take more action with less talk, David Cameron has done very little other than talk. But now, it appears he’s carved out some kind of official role for the opposition. 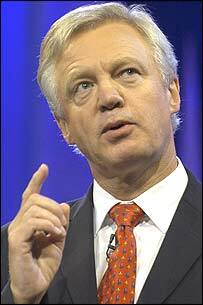 David Davis is writing to all of the major parties in the ID Cards scheme explaining that the Conservatives will be withdrawing the scheme should they form the next Government. It would actually seem that the opposition are living up to their promise – They’re actually taking action, preparing to form a government rather than simply talking. Now, of course, they could have done this at any point, but to be seen to be preparing in this way is a departure from the way the Conservatives have seemed to act for some years now. They finally appear to be building in confidence, and believing they can win. And if they believe they can win, then maybe they can convince other people too. As I’ve said many times, I don’t really care which party is in power, provided no-one has a large majority. Big majorities remove the need for compromise, and compromise generally brings refinement and improvement of law. Small majorities are preferable, as they force parties to co-operate to forge better legislation acceptable to all – not just those who voted for the party in power. And that ideal is facilitated by having an effective, confident, power-hungry opposition who can really split the vote. We might just be getting one. This 1,059th post was filed under: News and Comment, Politics.